Recently, after speaking at large conference, I was approached by a man who asked a question about the shape of crucifixion cross of Jesus. He’d been approached by Jehovah’s Witnesses who challenged the traditional shape of the cross. They argued the Greek word for “cross” (stauros) simply meant an “upright pole”, “upright stake” or “torture stake”. 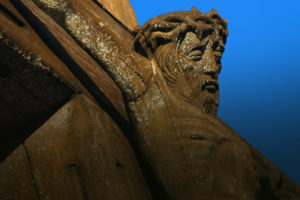 His Jehovah’s Witness visitors claimed Jesus was actually nailed to a straight stake with a single spike through his hands and another through his feet. In my experience with Jehovah’s Witnesses, I’ve also heard them argue the traditional Christian shape of the cross was borrowed from pagan sources and, as a result, it is un-Christian to acknowledge the traditional cross shape in church architecture, worship or adornment. While the Greek words used for the cross in the New Testament are not specific about its shape (“stauros” = stake / pole and “xulon” = timber / tree), there are several evidential clues offered in the scripture to help us understand the true shape of Jesus’ cross. “(The Jews caught outside the walls of Jerusalem) were first whipped, and then tormented with all sorts of tortures, before they died, and were then crucified before the wall of the city … the soldiers, out of the wrath and hatred they bore the Jews, nailed those they caught, one after one way, and another after another, to the crosses, by way of jest” (Josephus, Wars of the Jews, 5.11.1). “I see before me crosses not all alike, but differently made by different peoples: some hang a man head downwards, some force a stick upwards through his groin, some stretch out his arms on a forked gibbet” (Seneca the Younger, “To Marcia on Consolation”, in Moral Essays, 6.20). Sometimes they used a single upright stake or post and either nailed or tied their victim (in some cases this may have simply been to the trunk of a tree). With this shape of wood, the victim’s hands could be tied or nailed quite simply with a single piece of rope or a single nail, as many Jehovah’s Witnesses suggest. Sometimes the Roman soldiers used a Crux Commissa (“connected cross”). This is also referred to as “St. Anthony’s Cross” or the “Tau Cross” (after the Greek letter “Tau” it resembles). This structure was constructed from a horizontal beam connected at the top of the vertical stake, forming a “T” shape. Victims were nailed to the T with arms outstretched on either side of the horizontal beam. Their feet were either nailed together or separately to the bottom of the vertical post. Similar to the Crux Commissa, this third shape is the traditional form Christians observe for the cross (“Immissa” means “inserted”). This cross was constructed from a vertical stake with a horizontal cross beam (called a “patibulum”) inserted across the upper portion, leaving a “tip” extending above the patibulum. Sometimes this tip was little more than a small extension, resulting in a structure still resembling a “T” more than a “+”. Victims were nailed to the structure with arms outstretched on either side of the patibulum. Their feet were either nailed together or separately to the bottom of the vertical post. This “X” shaped cross (also known as “St. Andrew’s Cross”) borrowed its name from the Roman numeral ten (“decussis”). Two wooden planks were fastened together in an X configuration and the victim’s were nailed to the cross with arms outstretched on top ends of the X. Their feet were either nailed or tied separately to the bottom ends of the X. “(The original meaning of a word) used alone, cannot adequately account for the meaning of a word since meaning is continuously subject to change.… It is therefore mandatory for the New Testament student to know whether the original meaning of a word still exists at a later stage.… Hence it is not legitimate to say that the ‘original’ meaning of a word is its ‘real’ meaning” (David Alan Black Linguistics for Students of New Testament Greek Baker Books, Grand Rapids, 1988, 1995, p.122). “In shape we find three basic forms. The cross was a vertical, pointed stake… or it consisted of an upright with a cross-beam above it… or it consisted of two intersecting beams of equal length…” (Gerhard Kittel, Theological Dictionary of the New Testament: Volume 7, 1971, p. 572). In order to know precisely which shape of wood was used to crucify Jesus, we need to look at the cumulative case from other evidences. Dionysius used the word “xulon” for the horizontal “patibulum”. In this passage, the author again analogized the cross of Jesus with a passage from the Old Testament (this time from the life of Moses), interpreting the shape of Jesus’ cross as requiring “he stretched out his hands”. This would be the case in either the “Crux Commissa,” “Crux Immissa,” or “Crux Decussata”. The author refers to a version of the cross in which the victim’s hands would once again be outstretched as with the “Crux Commissa” or “Crux Immissa”. This description of the cross with two beams is far more similar to the “Crux Immissa” than any other form. Justin Martyr wrote several other passages describing the cross of Jesus in a similar way, analogizing it to a sail mast and staysail or describing the position of Jesus on the cross with outstretched hands. According to Artemidorus, criminals during this period of time were executed by Romans on a cross as wide as it was tall. This could once again refer to either the “Crux Commissa,” “Crux Immissa,” or “Crux Decussata”. Once again, an ancient author analogizes the cross to the letter “T”, as would be the case if the structure was a “Crux Commissa” or “Crux Immissa”. Given these ancient non-Biblical sources of information, the “Crux Simplex” is repeatedly eliminated by way of description. In addition, the “Crux Decussata” is typically eliminated based on the references to specific “T” shapes. But if “Crux Commissa” or “Crux Immissa” are still in the running, which of the two is the more reasonable inference? It’s time to examine the very best source of information we have about the cross of Jesus: the Biblical record. Truly, truly, I say to you, when you were younger, you used to gird yourself and walk wherever you wished; but when you grow old, you will stretch out your hands and someone else will gird you, and bring you where you do not wish to go.” Now this He said, signifying by what kind of death he would glorify God. Only one of the three forms of cross inferred from John’s Gospel would be properly shaped to allow for the placement of this sign above Jesus’ head. The traditional “Crux Commissa” is the best inference. The traditional “Crux Commissa” shape of Jesus’ cross is, in fact, the most reasonable inference, but to be fair, this inference is only slightly more reasonable than the “T” shaped “Crux Immissa”. The least reasonable form of crucifixion structure from the historic evidence of the Bible and the non-Biblical texts is the “Crux Simplex” described by Jehovah’s Witnesses. While the shape of the cross is not critical to our theology as Christians, it does provide us with an interesting opportunity to practice our investigative Case Making skills. Previous Why Shouldn’t We Trust the Non-Canonical “Second Treatise of the Great Seth”?